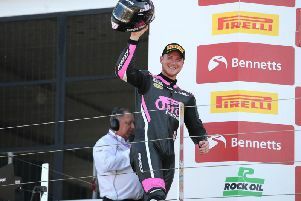 Jonathan Rea leads the World Superbike Championship by 14 points after winning race one at Aragon in Spain on Saturday. Jonathan Rea increased his lead in the World Superbike Championship after a gritty victory in race one at Aragon in Spain on Saturday. The race had to be restarted following a crash involving Leon Camier (Red Bull Honda), Jordi Torres (MV Agusta Reparto Corse) and Lorenzo Savadori (Milwaukee Aprilia). Camier went down at Turn 10 and Torres and Savadori were unable to avoid making contact. The British rider was taken to the medical centre for evaluation and was later described as conscious. After passing early pacesetter Alex Lowes (PATA Yamaha), Rea led the first half of the race on his Kawasaki until Xavi Fores hit the front on the Barni Ducati with nine laps remaining. Behind Rea, Ducati’s Marco Melandri and Chaz Davies were in touch as the race began to reach a climax. Rea appeared content to track Fores for a few laps before making his move, quickly clear and opening a gap of 0.8 seconds. The Ulster rider made a break for it as Fores, Davies and Melandri battled for the remaining podium places. It was a hard-earned win for Rea – his second of the season – who took the flag with 1.4 seconds in hand over Davies, who repelled a late attack by home favourite Fores on the final lap to clinch the runner-up spot. Melandri finished fourth ahead of Michael van der Mark (PATA Yamaha) and Tom Sykes (Kawasaki). Three-time champion Rea now leads the championship by 14 points from Melandri. Race two at Aragon is scheduled for 12:00 BST on Sunday. Meanwhile, Andy Reid won the National Superstock 1000 race at Brans Hatch on Saturday. The EHA Racing Aprilia rider came out on top of a battle with fellow Ulsterman Keith Farmer (Tyco BMW), winning by 0.7 seconds. Alastair Seeley (WD40 Kawasaki) finished in sixth place ahead of Josh Elliott on the Morello Kawasaki. Young gun Eunan McGlinchey won the opening Junior Supersport race. The Bennetts British Superbike races will take place on Sunday. Michael Laverty qualified fourth fastest on the Tyco BMW, with Donington double winner Bradley Ray sealing pole on the Bennetts Suzuki.